THE Chinese media frequently portray doctors not as life-saving heroes but as profit-seeking villains. Popular anger against medical staff sometimes spills over. One gruesome period in October last year saw at least six violent attacks by disgruntled patients on medical workers, including one that led to the death of a doctor. In 2012 there had been 11 such attacks and 7 deaths. One of the main reasons for such hostility is the high price of medicines and the corruption that contributes to it. Visitors to Chinese hospitals are often greeted with a sign that reads “no pharmaceutical representatives allowed”, a ban that has existed for more than a decade. Yet a recent spate of scandals involving public hospitals suggests that few heed the prohibition. China is expected to become the world’s second-largest pharmaceutical market by 2016, with total sales reaching $165 billion, according to IMS Health, a research firm. The soaring spending on drugs has been fuelled by an ageing population, the expanded coverage of public health insurance and the increasing demands of a wealthier society. But it is also the result of a system that inflates the cost of medicine. Even the cheapest generic drugs sold in Chinese hospitals are much more expensive than their international benchmark. Public hospitals in China are not so public in their funding: government subsidies only made up 9% of their revenues in 2011. By contrast, the sale of medicines accounts for 40%. Doctors are underpaid, so much of their income depends on how many drugs they prescribe. Hospitals are allowed to charge a 15% markup on the drugs they sell, so the more expensive the better. Consequently, China’s spending on medicines is 40% of total health expenditure, far higher than the average for OECD countries, of 16%. With few other sources of income, hospitals have to maximise their profits from drugs in order to subsidise medical services, says Zhu Hengpeng of the Chinese Academy of Social Sciences. So the high price of drugs is “institutionally justifiable”. The government has taken a series of measures to attack this problem, including price cuts on a wide range of medicines, but doctors were quick to adopt countermeasures, such as switching to more expensive alternatives or prescribing more unnecessary drugs. According to the health ministry, the average Chinese person consumes ten times more antibiotics than the average American. In July local authorities in the city of Zhangzhou in Fujian province recovered over 20m yuan ($3.3m) that more than 1,000 medical professionals had taken in bribes from pharmaceutical representatives. Drug firms have a strong incentive to get their products into the hands of doctors at hospitals, where 80% of China’s drugs are sold, and as a consequence many have stretched the definition of marketing and distribution. 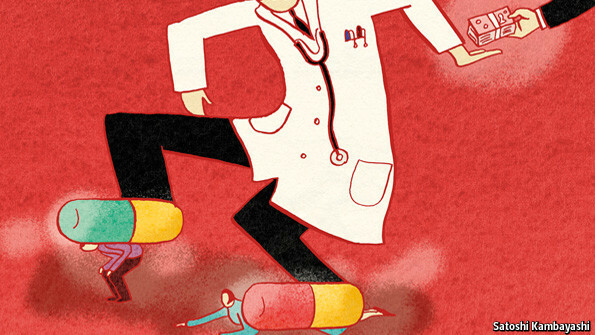 Chen Wenling, an economist in the research office of the State Council, China’s cabinet, estimates that kickbacks usually account for more than 20% of the final retail price of a drug sold. Some distributors issue or buy inflated invoices to extract large sums of cash, creating slush funds to bribe officials and doctors. In August Chinese authorities found two pharmaceutical distributors in Hebei province had issued fake invoices worth 776m yuan ($127m). The government announced a graft investigation in July into the Chinese operations of GlaxoSmithKline (GSK), a British conglomerate, in what appears to be part of a broader effort to crack down on bribery in health care. Four senior executives of the company have been detained over allegations of funnelling up to three billion yuan ($490m) to travel agencies to fund bribes to doctors and government officials. In an interview with state media, Liang Hong, a detained GSK executive, estimated that without this sort of spending their prices could be reduced by 20-30%. GSK has reiterated its opposition to the alleged misconduct and suggested it will lower its prices in China. The introduction of generic brands has driven down drug costs elsewhere in the world, but promoting their use is difficult in China. The incentive system works against the use of cheap drugs. Scandals involving unsafe local food and drugs add another obstacle: many doctors and patients favour foreign brand-name drugs, even if they are more expensive. Since 2009, in an effort to reduce the cost of medicines, authorities have required hospitals to buy them through bidding managed by health officials in each province. But the tenders do not always require brands to compete against generic drugs, so there is little pressure on prices. Where competition does develop between generic brands, the profit margins of drug companies are squeezed as they strive to offer bigger kickbacks to hospitals. When that happens, Chinese patients still do not benefit from cheaper prices. Lancet Global Health, a British journal, published a study in October showing that in 2012 the lowest-priced generic drugs were significantly harder to find in Shaanxi province than they had been two years earlier. It attributes the decrease in availability to the provincial bidding system, which squeezed the margins of some drug companies so much that they would rather not make or supply the drugs. According to state-owned media, that has created a shortage of some life-saving drugs across the country.